What is a cannabis "clone?" What are the advantages of taking marijuana clones? Well, first of all, cloning is one of the easiest and fastest ways for cannabis growers to make many new (and free) weed plants at once! Cloning cannabis is the process of making a smaller copy a specific cannabis plant. Basically a clone is a little piece of plant that has been cut off (a "cutting") from a parent plant and then given the opportunity to make roots of its own. Cannabis clones are cuttings from a marijuana plant - these cuttings make roots of their own and grow into an identical plant as the "mother!" Each cannabis clone has the same genes and is a genetic copy of its parent. That means if the parent of the clone is a female, you are guaranteed that all the clones taken from that cannabis plant will be female, too. Cloning cannabis lets you make dozens of (free) identical cannabis plants quickly! Save your favorite plants to grow again! Growers can take many clones of a single marijuana plant, and this is an easy way to get many plants that will grow the same way as the mother plant and produce buds with similar characteristics (smell, taste, potency, etc). What's Great About Growing Cannabis Clones? clones get a head-start compared to seedlings - Unlike a seedling, each clone is the same "age" as the parent and therefore is completely mature. As a result clones grow much faster for the first few weeks compared to seed-grown plants, especially for a larger clone. A newly rooted clone will grow faster than a similarly sized plant grown from seed! clones are a good choice for Sea of Green or 12/12 from seed techniques- Since marijuana clones are already mature, a clone not only grows faster vegetatively but can also be changed to the flowering stage immediately to create a Sea of Green or 12/12 from seed cannabis garden. For many cannabis growers, taking cuttings and cloning can be a great way of propagating a cannabis strain or a particularly nice cannabis plant without ever having to ever worry about male plants or making or buying seeds. Each clone is free! Like just about every important marijuana growing technique, there is controversy about the best way to clone cannabis plants. 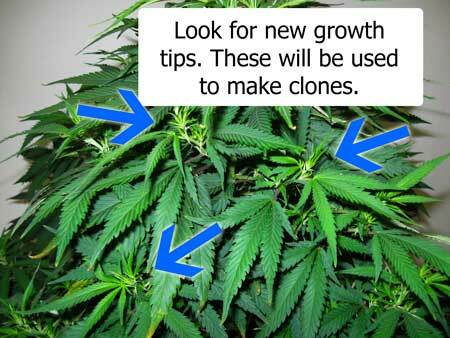 There are many effective techniques to clone plants and this tutorial will teach you how to clone today, but no matter what, cloning should only be used with the healthiest, most desirable plants you have. Although technically you can take a clone from any plant at almost any point in its life, you want to take clones of your best plants that have proven to be winners! Today I will walk you through the entire process of cloning marijuana, and clear up some of the myths and misinformation. 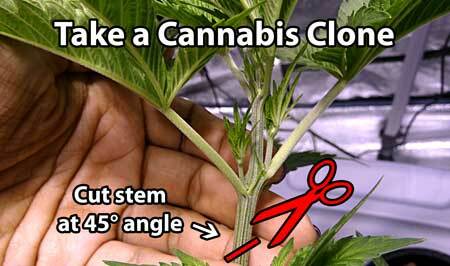 At it's simplest, cloning basically means cutting off a piece of plant and sticking it in the ground! 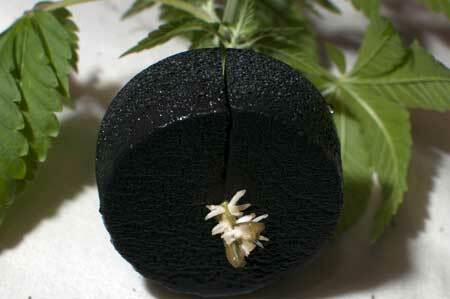 New roots grow out of the stem, and soon you have a new cannabis plant! Thanks to HerbLion for this incredible cannabis cloning roots picture! Before anything, clean and disinfect all your tools, and get everything ready, including setting out everything mentioned in the "What You Will Need to Clone Cannabis" section. Take clones from "mature" cannabis plants - if the leaves are alternating (not connecting at the exact same part of the stem) the plant is ready to clone. 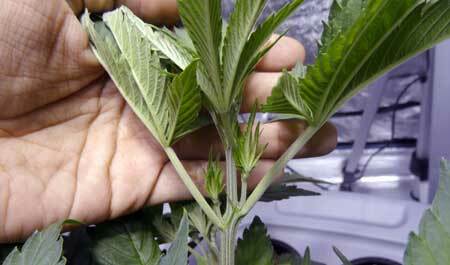 Here's an example of a marijuana stem with alternating leaves/nodes, perfect for cloning. Soak your starer cubes for a couple of minutes in the water. You don't need to soak them for days, a few minutes is fine. Choose a spot where there is new branching and a new top, and cut a little bit below that. Just firmly grab the new growth and cut the branch away at a 45 degree angle. New cuttings should be 5-8 inches (10-20 cm) long. When possible, take clones from vigorous growth tips from the lower half of your plant, as they have more rooting hormones than branches toward the top and will grow roots faster. However, clones taken from any part of the plant will work as long as they have a nice growth tip at the end..
Basically, you just want to cut away a small part of the plant. The roots will grow out of the "cut" you made, and the rest of the cutting will start growing into an individual plant. Many growers gently scrape or even split the bottom of the cutting so more "raw" insides get exposed. As you can see from the pictures below, the roots grow most easily from the parts of the stem that are raw, so scraping and splitting exposes more "insides," which gives more surface areas for roots to grow out of and promotes faster rooting. Immediately put your new marijuana cutting in a glass of water! This will help prevent bubbles from getting in the stem! Trim off any huge lower leaves or node points from the new cutting and clip the top fan leaves if they're big. Clipping the leaves helps prevent the weed clone from "over-exerting" itself trying to turn light into food, when the plant should be focused on roots. You can take cannabis clones using just plain water, and your cuttings will make roots just sitting in the water that way. 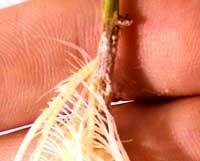 Some growers use rooting hormones and other cloning products to help the plant root faster. If you do plan to dip your cuttings, take your cuttings from the water and dip your newly scrapped cutting immediately into rooting hormone powder or gel to seal off air bubbles and give your cutting what it needs to start making roots. Some growers will use gel and then powder afterwards to get the best of both. Make sure you coat the entire bottom of the cutting, so that all the parts of the clone that get put into your starter cube is covered in gel. Place the new clone into a moistened starter cube, and press around the bottom to make sure everything is sealed and no air can get to the rooting area. If you have an automatic cloner or humidity dome, this is when you would place the new clone inside. When you recreate the right conditions, you don't need a cloner or humidity dome, yet these types of devices make successful cloning and root growth happen practically by itself. Yet if you follow the steps in this article, it's not a matter of if your clones will take root, but just a matter of when. Almost 100% of clones will take root if you follow these instructions and just giver her enough time. In the next section I'll explain exactly what your new clones need to thrive. Clones like warm, wet conditions. Your clones need to get their water through their leaves right now, because their roots haven't formed. That's why a nice humid cloner works great, or you can mist your plants a few times a day until they start forming roots. Some growers will use a heating pad under their clones to help keep things warm. A little warmer than room temperature 72-77 °F (22-25 °C ) is perfect. Many automatic cloners come with a heat setting. Some growers don't use any grow lights at all for the first 1-2 days while clones get settled. Other growers do give light right from the beginning. It's common to leave new clones in a warm, bright area for the first day or two, for example with a relatively weak grow light like a CFL bulb. Leave your grow lights on an 18/6 (Light/Dark) for your new clones. 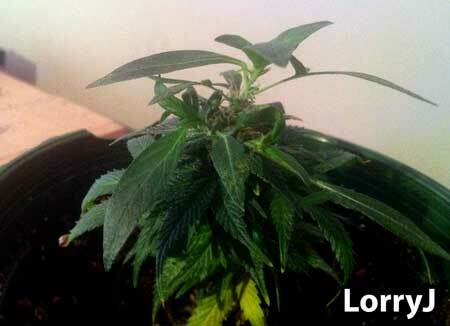 Don't give new clones 24 hours of light, without any dark periods. This can slow down the rooting process.Rooting seems to happen best when there's some amount of darkness each day. Clones want light from the beginning, but as they are focusing on making roots they don't want a whole lot since they aren't as strong as rooted plants! Cheap CFLs or other fluorescent grow lights like T5s are great cloning lights, as they're not too intense. 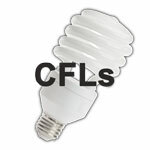 If you have just a small tent or cupboard to keep your clones, you can find CFLs at the grocery store, home improvement stores, even your local mini-mart! FLuorescent grow lights can be kept about 8-9" above your clones. HID grow lights like Metal Halide and High Pressure Sodium bulbs can work well for clones but need to be kept 2-3+ feet away from new clones so they don't get scorched. If you do start with intense lights, treat your cuttings like seedlings until your clones have formed strong roots. For example a 400W HPS grow light is good about 30 inches away from the top of your clones while they're rooting. 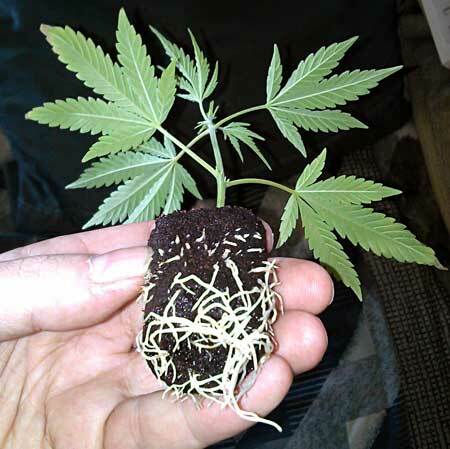 If you're growing in rockwool cubes or other starter cubes like Rapid Rooters, then you know your clones are ready to to be transplanted and receive regular light when you actually see the roots coming out the bottom of the cubes. 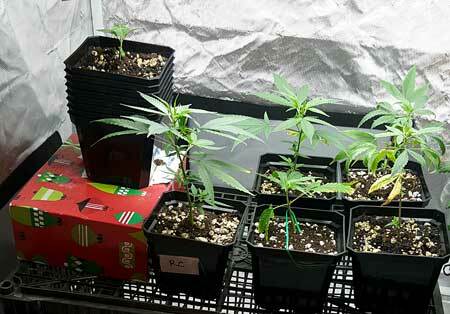 Remember, new clones are weak, and they should be treated gently like seedlings until they start growing vigorously. But within just a week or so, you will have fast-growing plants that are much bigger than any week-old seedling! And remember to be patient if it's your first time. Almost every cutting will take root if you just wait long enough, and keep providing the right conditions. Some plants will root in just a few days, 7 days is average, but some clones can take 2 weeks (or even more) to start showing roots! This is why many growers buy cloners, or a tray with a humidity dome (a clear plastic top to put over their plants), since they will keep your cuttings nice and moist for you and practically automate the whole process. However, with a humidity dome it's extra important to keep an eye out for mold. If you don't have a humidity dome (or even if you do) it can be a good idea to mist your clones with water after you're done to keep them moist.If you can mist your clones a couple of times a day so they don't dry out, you may be able to skip the clear top altogether. Another option is put the clear top over your plants while you're away from your grow area(like when you're at work), then take it off while you're around to check on your clones and mist them regularly with water. Most domes have vents to let them expell extra air, and you will want to open them if it starts looking too misty in there! In addition to cloning gel or powder, some growers recommend to spray the leaves with a very mild nutrient solution, as the clones can absorb a tiny bit of nutrients through their leaves. 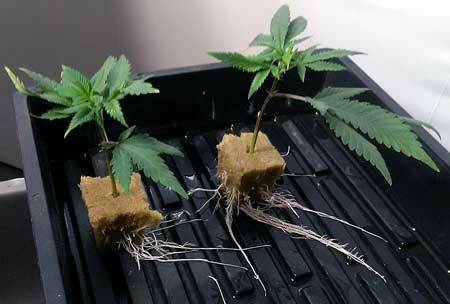 To promote root growth, try to give new clones a minimum level of nitrogen and possibly increased levels of phosphorus. Basically, any sort of flowering nutrients would be well suited to give to new clones. However, make sure if you're feeding them nutes to give them only 1/4 to 1/2 the recommended amounts for seedlings! When creating clones, many people prefer to use some sort of cloning solution or powder, which contain hormones that help the clone root and can be purchased from a grow shop, garden store, or off the internet. Rootech Cloning Gel is a great choice. 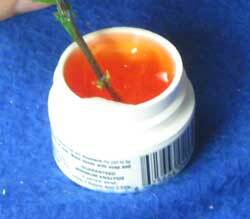 Gels tend to evenly coat the plant much better than powders, but if you're not sure you can use both! Store your rooting powder or gel in a cool, dark, dry place and never use "contaminated" rooting powder or gel. If the package was unsealed when you got it, or if you've dropped anything into the rooting hormone, discard and get a fresh package. Foreign materials like leaves, dirt, dust, etc can cause bad stuff to grow in your gel or powder, and will negatively affect your cloning results. Some cloning gels come with a handy applicator tip, which makes it easier to use and reduces waste and the chance of contamination. You will tend to get better results if you use clones from a well-established plant (at least two months old). Younger plants may not be totally mature, and their clones can take a lot longer to root, or may not root at all. If you grow a plant in the vegetative stage for about 2-3 months, you will be able to get dozens of clones off a single plant. It's completely fine if you plan on just taking a couple of clones from a plant then letting it continue growing. In fact, it's best to take the clones off the bottom of the plant since these clones tend to take root in much less time than clones taken from the top of the plant. If getting plants to root as fast as possible, it's best to take the clones off the bottom of the plant since these clones tend have more root hormones and tend to take root in less time as clones taken from the top of the plant. If you want to flower the plant right away to determine the gender, then you'll often have better luck taking a clone from the top of the plant, which tends to be more primed to flowering. If possible, give a potential mother less nitrogen then usual when feeding for a week or two before cloning as this will promote better rooting in her clones. Regular flowering nutrients work well. Save yourself a boatload of frustration by always taking more cuttings than you need. You will lose a few clones in the beginning, but I promise it will get easier. Some clones take longer to root. I've had a clone that didn't really do anything for almost a month (it didn't wilt or grow) and I was just about to throw it away, before it suddenly exploded with new growth and became a healthy adult plant. However, it's usually a lot easier to take many extra marijuana clones, and throw away any that are taking longer than the others to make roots. 8.) Don't forget to label every cannabis clone, or you will regret it! 9.) 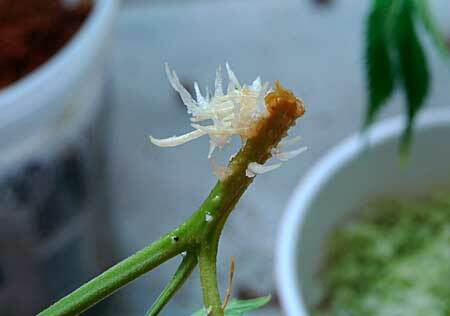 A cannabis clone from a flowering plant will grow differently at first, this is normal! You want to take clones off a cannabis plant when it's in the vegetative stage if possible because cuttings will root faster, but you can also take clones from a flowering plant if you have a prize plant you want to save. When taking clones from a flowering cannabis plant, choose clones from the bottom of the plant and immediately pinch away any buds you see. Other than that you can treat new clones exactly the same as any other. Clones from flowering plants may grow more "bushy" than their parent plant, and will often show other strange growing patterns especially in the first few weeks after being cloned (for example rounded leaves). It's completely normal for clones taken during the flowering stage to have weird leaves and growth patterns for the first few weeks. Marijuana clones taken from a flowering plant will display strange growth for the first few weeks, but leaves will soon start growing normally again. Pictured to the left is an example of a "mother" plant. This plant is known to be female, so all her clones will be female too. All clones are genetically identical to the plant you took them from. So if you have an incredible specimen of a plant, you can make more plants that will have all very similar characteristics as the mother cannabis plant. You can take dozens of clones from a single plant. In fact anywhere there's a "growth tip" will yield a clone! As the grower, you're looking for hardy female plants with fast growth, big roots, huge yields, and potent buds. Now it is generally recommended to take clones during the vegetative stage of marijuana because clones taken during the flowering stage can have a much harder time taking root. However if you take clones from the bottom of a cannabis plant in the flowering stage, you can usually get it to clone by pinching off any buds and following the normal steps. This can be a great way to save a plant that is performing really well in the flowering stage! Note: Some growers take clones during the flowering stage on purpose, with a technique known as Monster Cropping. 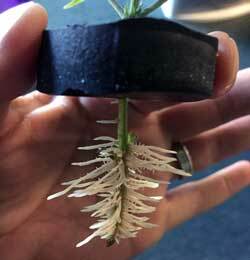 Clones taking during the flowering stage can sometimes display unusual growth patterns and can become crazy branching monsters. Depending on the grow setup, this can be taken advantage of. Ok, so you want to take clones during the vegetative stage if possible, yet how do you choose the best mother plants that will give you the most potent buds and greatest yields? You don't know how the plant is going to turn out yet since she's still in the vegetative stage. You could just choose to clone any plant, and maybe that's what you want to do if this is your first time cloning. Yet if you want to get the best results, you should choose to grow clones from only the best plants. But how do you know which plants are going to be good when you have to clone in the vegetative stage? How do you even know if the plant is a boy or a girl? There are two major ways to identify male and female plants in the vegetative stage. Looking at pre-flowers or taking an early clone and flowering it. Although you can identify the gender of a cannabis plant when it's just 3-6 weeks old from seed, you may choose to flower your plant earlier, and therefore won't know the gender. 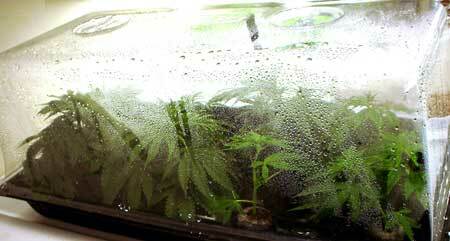 To get around this, you can always take clones of all your plants right before you put them into the flowering stage. This will give you a "copy" just in case any of your plants end up blowing you away with quality. 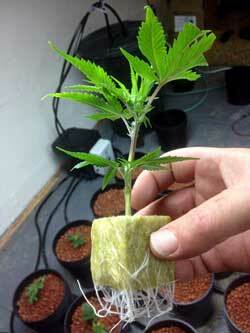 Keep these clones in the vegetative stage and allow them to start growing. I have a vegetative tent and flowering tent, and I just stick new, healthy clones in the vegetative tent until I'm ready to flower them. 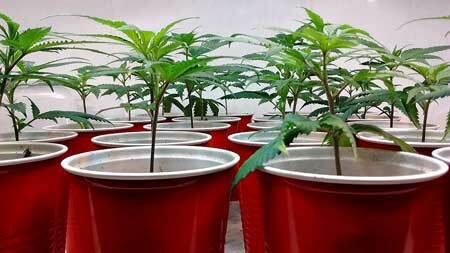 Continue to nurture these new clones and allow them to start growing into full-size plants. Meanwhile, as your main garden starts flowering, the "parent" plants will start revealing their true characteristics. At this point, throw away any clones that came from a male plant, or from a plant which grows slowly. You'll be glad you labeled them! After harvest, you will know which plants had the best yields, growth, etc. Keep the clones you took from these best plant(s). These clones will become your "mother" plants which you can take further clones from whenever you need new babies. How do you keep a mother plant from getting too big? You can easily keep a mother plant in the vegetative stage for two years or more as long as you keep the plant under a vegetative light schedule. Any clones can be kept in the same place until you're ready to move them into your main growing area. Make sure the mother plant is well-fed and happy, so that any clones you take off her are healthy and strong. However, if you keep light and nutrient levels low, the plant will tend to grow slower, so you can keep the genetics without growing a huge plant. You can take clones off the top of the plant to help control height, and plant training can be used to train a plant to grow into almost any size and shape. 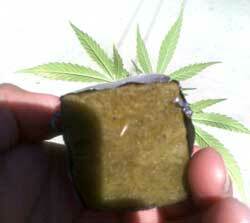 Enjoy the power of marijuana cloning! Cloning gives you the power to take one plant and get unlimited new cannabis plants for practically forever! You can clone clones without a problem. Each new clone is a genetic copy of the original plant.